I love “nice” cream, but I don’t love it after it’s been frozen for a long time because it hardens so that you can’t dig your spoon in. I’m always too impatient to let it stand out of the freezer for 30 minutes. 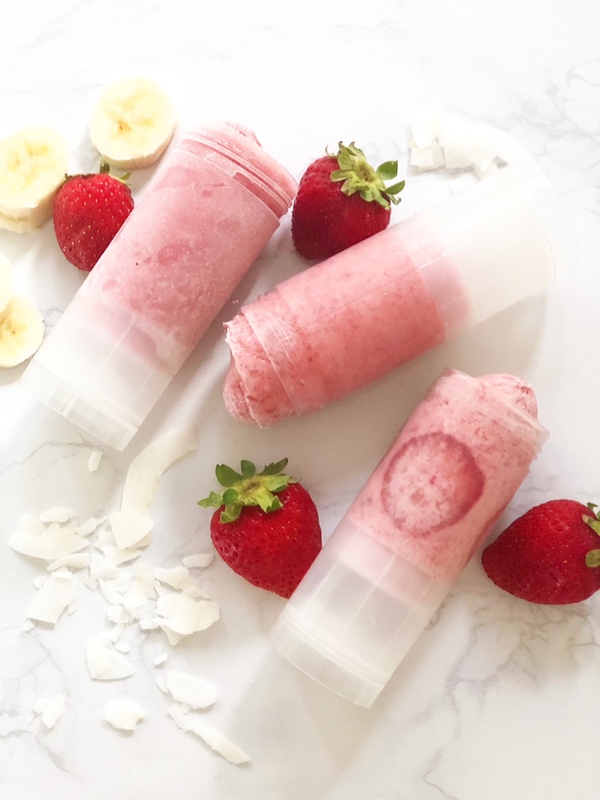 So I came up with the idea to turn it into nice cream push-up pops. And now the family wants them every single night! You can use any fruit combo, but I love the pairing of organic strawberries, banana, and coconut milk. This way you have a super creamy treat. I used my cosmetic BPA-free twist-up tubes because they make tiny pops, and that’s exactly what I wanted. Sometimes a little taste is all I want after dinner! Place the banana and strawberries in a food processor and process until smooth. Stir in the coconut milk. I like to stir it (rather than process it), in so that it creates a marbled look. Pour into the twist-up tubes. I like to press a few strawberry slices inside the inner edge of the tube as it looks pretty. They will want to float away from the edges, so use a small knife to stick them against the side. Pop them in the freezer right away. Make sure they are level, so they don’t freeze lopsided. Freeze for at least 5 hours, or overnight.